The Battle of Kursk was a Second World War engagement between German and Soviet forces on the Eastern Front near Kursk (450 kilometres or 280 miles south-west of Moscow) in the Soviet Union during July and August 1943. The German offensive was code-named Operation Citadel (German: Unternehmen Zitadelle) and led to one of the largest armoured clashes in history, the Battle of Prokhorovka. The German offensive was countered by two Soviet counter-offensives, Operation Polkovodets Rumyantsev (Russian: Полководец Румянцев) and Operation Kutuzov (Russian: Кутузов). For the Germans, the battle was the final strategic offensive that they were able to launch on the Eastern Front. Their extensive loss of men and tanks ensured that the victorious Soviet Red Army enjoyed the strategic initiative for the remainder of the war. The Germans hoped to weaken the Soviet offensive potential for the summer of 1943 by cutting off a large number of forces that they anticipated would be in the Kursk salient. The Kursk salient or bulge was 250 kilometres (160 mi) long from north to south and 160 kilometres (99 mi) from east to west. The plan envisioned an envelopment by a pair of pincers breaking through the northern and southern flanks of the salient. Adolf Hitler believed that a victory here would reassert German strength and improve his prestige with his allies, who were considering withdrawing from the war. It was also hoped that large numbers of Soviet prisoners would be captured to be used as slave labour in the German armaments industry. As the Battle of Stalingrad slowly ground to its conclusion the Red Army moved to a general offensive in the south, pressuring the exhausted German forces who had survived the winter. By January 1943, a 160 to 300 km (99 to 186 mi) wide gap had opened between Army Group B and Army Group Don, and the advancing Soviet armies threatened to cut off all German forces south of the Don River, including Army Group A operating in the Caucasus. Army Group Center came under significant pressure as well. Kursk fell to the Soviets on 8 February 1943, and Rostov on 14 February. The Soviet Bryansk, Western, and newly created Central Fronts prepared for an offensive which envisioned the encirclement of Army Group Center between Bryansk and Smolensk. By February 1943 the southern sector of the German front was in strategic crisis. Since December 1942 Field Marshal Erich von Manstein had been strongly requesting "unrestricted operational freedom" to allow him to use his forces in a fluid manner. On 6 February 1943, Manstein met with Hitler at the headquarters in Rasternburg to discuss the proposals he had previously sent. He received an approval from Hitler for a counteroffensive against the Soviet forces advancing in the Donbass region. On 12 February 1943, the remaining German forces were reorganised. To the south, Army Group Don was renamed as Army Group South and placed under Manstein's command. Directly to the north, Army Group B was dissolved, with its forces and areas of responsibility divided between Army Group South and Army Group Center. Manstein inherited responsibility for the massive breach in the German lines. On 18 February, Hitler arrived at Army Group South headquarters, at Zaporizhia, hours before the Soviets liberated Kharkov and had to be hastily evacuated on the 19th. The operation was hastily prepared and did not receive a name. Later known as Third Battle of Kharkov, it commenced on 21 February, as 4th Panzer Army under General Hoth launched a counter-attack. The German forces cut off the Soviet mobile spearheads and continued the drive north, retaking Kharkov on 15 March and Belgorod on 18 March. 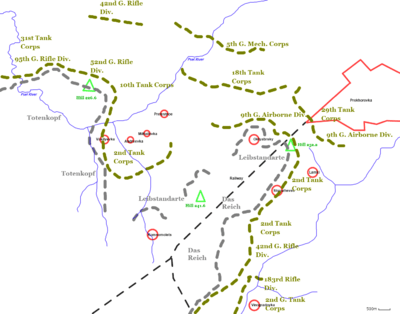 A Soviet offensive launched on 25 February by the Central Front against Army Group Center had to be abandoned by 7 March to allow the attacking formations to disengage and redeploy to the south to counter the threat of the advancing German forces under Manstein. Exhaustion of both the Wehrmacht and the Red Army coupled with the loss of mobility due to the onset of the spring rasputitsa resulted in the cessation of operations for both sides by mid-March. The counteroffensive left a salient extending into the German area of control, centered around the city of Kursk. The heavy losses sustained by the Heer (army) since the opening of Operation Barbarossa had resulted in a shortage in infantry and artillery. Units were in total 470,000 men understrength. For the Wehrmacht to undertake an offensive in 1943 the burden of the offensive, in both attacking the Soviet defenses and holding ground on the flanks of the advance, would have to be carried primarily by the panzer divisions. In view of the exposed position of Army Group South, Manstein proposed that his forces should take the strategic defensive. He anticipated that a Soviet offensive would attempt to cut off and destroy Army Group South by a move across the Donets River toward the Dnieper. In February, he proposed waiting for this offensive to develop and then delivering a series of counterattacks into the exposed Soviet flanks. Hitler, concerned about the political implications of taking a defensive stance, and preoccupied with holding the Donbass, rejected this plan. On 10 March, Manstein presented an alternative plan whereby the German forces would pinch off the Kursk salient with a rapid offensive commencing as soon as the spring rasputitsa had subsided. Operation Citadel called for a double envelopment, directed at Kursk, to surround the Soviet defenders of five armies and seal off the salient. Army Group Centre would provide General Walter Model's 9th Army to form the northern pincer. It would cut through the northern face of the salient, driving south to the hills east of Kursk, securing the rail line from Soviet attack. Army Group South would commit the 4th Panzer Army, under Hermann Hoth, and Army Detachment Kempf, under Werner Kempf, to pierce the southern face of the salient. This force would drive north to meet the 9th Army east of Kursk. 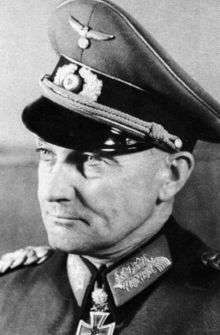 Von Mainstein's main attack was to be delivered by Hoth's 4th Panzer Army, spearheaded by the II SS Panzer Corps under Paul Hausser. The XLVIII Panzer Corps, commanded by Otto von Knobelsdorff, would advance on the left while Army Detachment Kempf would advance on the right. The 2nd Army, under the command of Walter Weiss, would contain the western portion of the salient. On 27 April Model met with Hitler to review and express his concern for reconnaissance information which showed the Red Army constructing very strong positions at the shoulders of the salient and having withdrawn their mobile forces from the area west of Kursk. He argued that the longer the preparation phase continued, the less the operation could be justified. He recommended completely abandoning Citadel, allowing the army to await and defeat the coming Soviet offensive, or radically revising the plan for Citadel. Though in mid-April Manstein had considered the Citadel offensive profitable, by May he shared Model's misgivings. He asserted that the best course of action would be for the German forces to take the strategic defensive, ceding ground to allow the anticipated Soviet forces to extend themselves and allow the German panzer forces to counterattack in the type of fluid mobile battle at which they excelled. 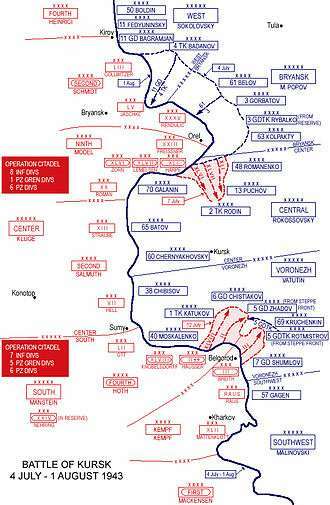 Convinced that the Red Army would deliver its main effort against Army Group South, he proposed to keep the left wing of the army group strong while moving the right wing back in stages to the Dnieper River, followed by a counterattack against the flank of the Red Army advance. The counteroffensive would continue until the Sea of Azov was reached and the Soviet forces were cut off. Hitler rejected this idea; he did not want to give up so much terrain, even temporarily. Hitler called his senior officers and advisors to Munich for a meeting on May 4. Hitler spoke for about 45 minutes on the reasons to postpone the attack, essentially reiterating Model's arguments. A number of options were put forth for comment: going on the offensive immediately with the forces at hand, delaying the offensive further to await the arrival of new and better tanks, radically revising the operation or canceling it altogether. Manstein advocated an early attack, but requested two additional infantry divisions, to which Hitler responded that none were available. Kluge spoke out strongly against postponement and discounted Model's reconnaissance materials. Albert Speer, the minister of Armaments and War Production, spoke about the difficulties of rebuilding the armoured formations and the limitations of German industry to replace losses. General Heinz Guderian argued strongly against the operation, stating "the attack was pointless". The conference ended without Hitler coming to a decision, but Citadel was not aborted. Three days later, OKW, Hitler's conduit for controlling the military, postponed the launch date for Citadel to 12 June. 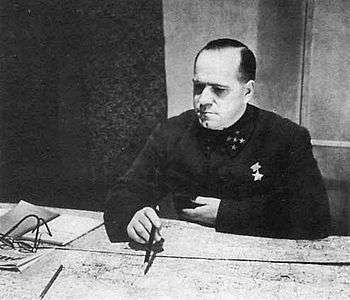 With pessimism for Citadel increasing with each delay, in June, Alfred Jodl, the Chief of Staff at the OKW, instructed the armed forces propaganda office to portray the upcoming operation as a limited counteroffensive. Due to concerns of an Allied landing in the south of France or in Italy and delays in deliveries of the new tanks, Hitler postponed again, this time to 20 June. [lower-alpha 15] Zeitzler was profoundly concerned with the delays, but he still supported the offensive. On 17–18 June, following a discussion in which the OKW Operations Staff suggested abandoning the offensive, Hitler further postponed the operation until 3 July. Finally, on 1 July, Hitler announced 5 July as the launch date of the offensive. A Raupenschlepper Ost, designed in response to the poor roads of Russia, moves material up shortly before the Kursk offensive. Marshal of the Soviet Union Georgi Zhukov, 1941. Stalin consulted with his frontline commanders and senior officers of the General Staff from 12 to 15 April 1943. In the end he and the Stavka agreed that the Germans would probably target Kursk. Stalin believed the decision to defend would give the Germans the initiative, but Zhukov countered that the Germans would be drawn into a trap where their armoured power would be destroyed, thus creating the conditions for a major Soviet counteroffensive. They decided to meet the enemy attack by preparing defensive positions to wear out the German groupings before launching their own offensive. Preparation of defences and fortifications began by the end of April, and continued until the German attack in early July. The two-month delay between the German decision to attack the Kursk salient and its implementation allowed the Red Army ample time to thoroughly prepare. The Voronezh Front, commanded by Nikolai Vatutin, was tasked with defending the southern face of the salient. The Central Front, commanded by Konstantin Rokossovsky, defended the northern face. Waiting in reserve was the Steppe Front, commanded by Ivan Konev. In February 1943, the Central Front had been reconstructed from the Don Front, which had been part of the northern pincer of Operation Uranus and had been responsible for the destruction of the 6th Army at Stalingrad. The Central and Voronezh Fronts each constructed three main defensive belts in their sectors, with each subdivided into several zones of fortification. The Soviets employed the labour of over 300,000 civilians. [lower-alpha 17] Fortifying each belt was an interconnected web of minefields, barbed-wire fences, anti-tank ditches, deep entrenchments for infantry, anti-tank obstacles, dug-in armoured vehicles, and machine-gun bunkers. Behind the three main defensive belts were three more belts prepared as fallback positions; the first was not fully occupied or heavily fortified, and the last two, though sufficiently fortified, were unoccupied with the exception of a small area in the immediate environs of Kursk. The combined depth of the three main defensive zones was about 40 kilometres (25 mi). The six defensive belts on either side of Kursk were 130–150 kilometres (81–93 mi) deep. If the Germans managed to break through these defences they would still be confronted by additional defensive belts to the east, manned by the Steppe Front. These brought the total depth of the defences to nearly 300 kilometres (190 mi). Special training was provided to the Soviet infantry manning the defences to help them overcome the tank phobia that had been evident since the start of the German invasion. Soldiers were packed into trenches and tanks were driven overhead until all signs of fear were gone. [lower-alpha 18] This training exercise was referred to by the soldiers as "ironing". In combat, the soldiers would spring up in the midst of the attacking infantry to separate them from the spearheading armoured vehicles. The separated armoured vehicles – now vulnerable to infantry armed with anti-tank rifles, demolition charges and Molotov cocktails – could then be disabled or destroyed at point-blank range. These types of attacks were mostly effective against the massive Ferdinand tank destroyers, which lacked machine guns as secondary armament. The soldiers were also promised financial rewards for each tank destroyed, with the People's Commisariat of Defence providing 1,000 rubles for destroyed tanks. The main tank of the Soviet tank arm was the T-34, on which the Red Army attempted to concentrate production. The tank arm also contained large numbers of the T-70 light tank. For example, the 5th Guards Tank Army roughly contained 270 T-70s and 500 T-34s. In the salient itself the Soviets assembled a large number of lend-lease tanks. These included U.S.-manufactured M3 Lees and British-built Churchills, Matildas and Valentines. However, the T-34 made up the bulk of the Soviet armour. Without including the deeper reserves organised under the Steppe Front, the Soviets massed about 1,300,000 men, 3,600 tanks, 20,000 artillery pieces and 2,792 aircraft to defend the salient. This amounted to 26 percent of the total manpower of the Red Army, 26 percent of its mortars and artillery, 35 percent of its aircraft and 46 percent of its tanks. By 1943 the Luftwaffe's strength on the Eastern Front had started to weaken, especially after Stalingrad. The Luftwaffe forces in the east were further depleted with squadrons being shifted back to Germany to defend against the increasing Allied bombing campaign. By the end of June, only 38.7 percent of the Luftwaffe's total aircraft remained in the east. In 1943 the Luftwaffe could still achieve local air superiority by concentrating its forces. The majority of German aircraft left available on the Eastern Front were slated for Citadel. The goal of the Luftwaffe remained unchanged. The priority of the German air fleet(s) was to gain air superiority, then to isolate the battlefield from enemy reinforcements, and finally, once the critical point had been reached in the land battle, to render close air support. VVS Ilyushin Il-2 ground attack aircraft during the Kursk battle. In the months preceding the battle, Luftflotte 6 supporting Army Group Center noted a marked increase in the strength of the opposing VVS formations. The VVS formations encountered displayed better training, and were flying improved equipment with greater aggressiveness and skill than the Luftwaffe had seen earlier. The introduction of the Yakovlev Yak-9 and Lavochkin La-5 fighters gave the Soviet pilots near parity with the Luftwaffe in terms of equipment. Furthermore, large numbers of ground-attack aircraft, such as the Ilyushin Il-2 "Shturmovik" and the Pe-2, had become available as well. The Soviet Air Force also fielded large quantities of aircraft supplied via lend-lease. Huge stockpiles of supplies and ample reserves of replacement aircraft meant the Red Army and VVS formations would be able to conduct an extended campaign without slackening in the intensity of their effort. German industry produced 2,816 tanks and self-propelled guns between April and June, of which 156 were Tigers and 484 Panthers. At Kursk, a total of 259 Panthers, about 211 Tigers, and 90 Ferdinands were used. ↑ Frieser uses combat strengths. ↑ Frieser counts only operational tanks. ↑ Glantz uses total strengths. ↑ Glantz does not count reinforcements. In the early morning of 5 July, the VVS launched a large raid against German airfields, hoping to destroy the Luftwaffe on the ground. This effort failed, and the Red Army air units suffered considerable losses. 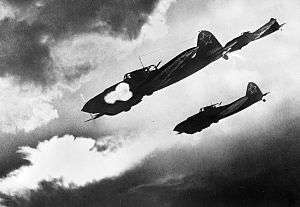 [lower-alpha 20] The VVS lost 176 aircraft on 5 July, compared to the 26 aircraft lost by the Luftwaffe. The losses of the VVS 16th Air Army operating in the northern face were lighter than those suffered by the 2nd Air Army. The Luftwaffe was able to gain and maintained air superiority over the southern face until 10–11 July, when the VVS began to obtain ascendency  but the control of the skies over the northern face was evenly contested until the VVS began to gain air superiority on 7 July, which it maintained for the rest of the operation. Following a preliminary bombardment and Red Army counter bombardments, the 9th Army opened its attack at 05:30 on 5 July. Nine infantry divisions and one panzer division, with attached assault guns, heavy tanks, and tank destroyers, pushed forward. Two companies of Tiger tanks were attached to the 6th Infantry Division, and were the largest single grouping of Tigers employed that day. Opposing them were the 13th and 70th Armies of the Central Front. Facing Army Detachment Kempf, consisting of III Panzer Corps and Corps Raus (commanded by Erhard Raus), were the 7th Guards Army, dug in on the high ground on the eastern bank of the Northern Donets. The two German corps were tasked with crossing the river, breaking through the 7th Guards Army and covering the right flank of the 4th Panzer Army. The 503rd Heavy Tank Battalion, equipped with 45 Tigers, was also attached to the III Panzer Corps, with one company of 15 Tigers attached to each of the three panzer divisions. The 10th Tank Corps, then still subordinate to the 5th Guards Army, was rushed ahead of the rest of the army, arriving at Prokhorovka on the night of 7 July, and 2nd Tank Corps arrived at Korocha, 25 miles (40 km) southeast of Prokhorovka, by morning of 8 July. Vatutin ordered a powerful counterattack by the 5th Guards, 2nd Guards, 2nd and 10th Tank Corps, in all fielding about 593 tanks and self-propelled guns and supported by most of the Front's available air power, which aimed to defeat the II SS Panzer Corps and therefore expose the right flank of XLVIII Panzer Corps. Simultaneously, the 6th Tank Corps was to attack the XLVIII Panzer Corps and prevent it from breaking through to the free Soviet rear. Although intended to be concerted, the counterattack turned out to be a series of piecemeal attacks due to poor coordination. The 10th Tank Corps' attack began on the dawn of 8 July but they ran straight into the antitank fire of the 2nd and 3rd SS Divisions, losing most of its forces. Later that morning, the 5th Guards Tank Corps' attack was repelled by the 3rd SS Division. The 2nd Tank Corp joined in the afternoon and was also repelled. The 2nd Guards Tank Corps, masked by the forest around the village Gostishchevo, 10 miles (16 km) north of Belgorod, with its presence unknown to the II SS Panzer Corps, advanced towards the 167th Infantry Division. But it was detected by German air reconnaissance just before the attack had materialized, and was subsequently decimated by German ground-attack aircraft armed with MK 103 anti-tank cannons and at least 50 tanks were destroyed. This marked the first time in military history an attacking tank formation had been defeated by air power alone. Although a fiasco, the Soviet counterattack succeeded in stalling the advance of the II SS Panzer Corps throughout the day. Though the German advance in the south was slower than planned, it was faster than the Soviets expected. On 9 July, the first German units reached the Psel River. The next day, the first German infantry crossed the river. Despite the deep defensive system and minefields, German tank losses were low. At this point, Hoth turned the II SS Panzer Corps from a northward heading directed toward Oboyan to a northeast heading towards Prokhorovka. The main concern of Manstein and Hausser was the inability of Army Detachment Kempf to advance and protect the eastern flank of the II SS Panzer Corps. On 11 July, Army Detachment Kempf finally achieved a breakthrough. In a surprise night attack, the 6th Panzer Division seized a bridge across the Donets. Once across, Breith made every effort to push troops and vehicles across the river for an advance on Prokhorovka from the south. A linkup with the II SS Panzer Corps would result with the Soviet 69th Army becoming encircled. It appeared the hoped for breakthrough was at hand. Hausser had expected to continue his advance on Prokhorovka, and late on the evening of 11 July issued orders for the attack the next day. The attack would begin north of the Psel River, with the 3rd SS Panzer Division driving northeast until reaching the Karteschewka-Prokhorovka road. Once there, they were to strike southeast to attack the Soviet positions at Prokhorovka from the rear. The 1st and 2nd SS Panzer divisions were to wait until Totenkopf's attack had destabilised the Soviet positions at Prokhorovka. Once the Soviet position at Prokhorovka was under attack from the rear, the Leibstandarte was to move forward, advancing through the main Soviet defences dug in on the west slope before Prokhorovka. To the Leibstandarte's right, the 2nd SS was to advance eastward to the high ground south of Prokhorovka, then turn south to roll up the Soviet line and open a gap. Unknown to Hausser, on the night of 11–12 July Rotmistrov had moved his 5th Guards Tank Army to an assembly area just behind Prokhorovka in preparation for a massive attack the following day. At 5:45 Leibstandarte headquarters started receiving reports of the ominous sound of tank engines as the Soviets moved into their assembly areas. Soviet artillery and Katyusha regiments were redeployed in preparation for the counterattack. At around 08:00, a Soviet artillery barrage began. At 08:30, Rotmistrov radioed his tankers: "Steel, Steel, Steel! ", the order to commence the attack. Down off the west slopes, before Prokhorovka, came the massed armour of five tank brigades from the two Soviet tank corps. The 1st SS had just started to advance, when it was taken largely by surprise. As the Soviet tanks aggressively advanced down the corridor, they carried the infantrymen of the 9th Guards Airborne Division into battle mounted on the tanks with the paratroopers holding onto rails. Amid the swirls of dust, a highly confused tank battle began. To the north and east, the 3rd SS was engaged by the Soviet 33rd Guards Rifle Corps. Tasked with destabilising the Soviet defences before Prokhorovka, the unit first had to beat off a number of attacks before they could go over onto the offensive. Most of the division's tank losses occurred late in the afternoon as they advanced through mine fields against well-hidden Soviet anti-tank guns. Although the 3rd SS succeeded in reaching the Karteschewka-Prokhorovka road, their hold was tenuous and it cost the division half of its armour. The majority of German tank losses suffered at Prokhorovka occurred here. To the south, the Soviet 18th and 29th Tank Corps, of the 5th Guards Tank Army, had been thrown back by the 1st SS acting alone. Meanwhile, the 2nd SS was holding a line to the south against the 2nd Tank Corps and the 2nd Guards Tank Corps. By early afternoon, it was clear that Rotmistrov's attack had failed. Luftwaffe local air superiority over the battlefield also contributed to the Soviet losses, partly due to the VVS being directed against the German units on the flanks of II SS Panzer Corps. By the end of the day, the Soviets had fallen back to their starting positions. The battle is considered a tactical defeat for the Red Army due to the heavy tank losses, but operationally was a draw or a Soviet victory. Neither the 5th Guards Tank Army nor the II SS Panzer Corps accomplished their objectives. Though the Soviet counterattack failed and they were thrown back onto the defensive, they did enough to stop a German breakthrough. Tank losses during the battle have been a contentious subject. Soviet tank losses have been estimated from 200 to 822, but Soviet records show about 300 complete losses and as many damaged. The Soviets claimed enormous German losses, stating they had destroyed at least 400 tanks, including 100 Tiger tanks and inflicting 3,500 deaths. German records indicate 3 to 5 of their own tanks destroyed, and between 40 and 70 damaged. Their manpower losses are estimated at 500 killed. On the evening of 12 July, Hitler summoned Kluge and Manstein to his headquarters at Rastenburg in East Prussia. Two days earlier, the Western Allies had invaded Sicily. The threat of further Allied landings in Italy or along southern France made Hitler believe it was essential to move forces from Kursk to Italy and to discontinue the offensive. Kluge welcomed the news, as he was aware that the Soviets were initiating a massive offensive against his sector, but Manstein was less welcoming. Manstein's forces had just spent a week fighting through a maze of defensive works and he believed they were on the verge of breaking through to more open terrain, which would allow him to engage and destroy the Soviet armoured reserves in a mobile battle. Manstein stated, "On no account should we let go of the enemy until the mobile reserves he [has] committed [are] completely beaten." Hitler agreed to temporarily allow the continuance of the offensive in the south part of the salient, but the following day he ordered Manstein's reserve – the XXIV Panzer Corps – to move south to support the 1st Panzer Army. This removed the force Manstein believed was needed to succeed. On 16 July, German forces withdrew to their start line. The following day, OKH ordered the II SS Panzer Corps to be withdrawn and transferred to Italy. The strength of the Soviet reserve formations had been greatly underestimated by German intelligence, and the Red Army soon went onto the offensive. In his post-war apologist memoirs Lost Victories, Manstein was highly critical of Hitler's decision to call off the operation at the height of the tactical battle. The veracity of Manstein's claims of a near victory is debatable. The extent of Soviet reserves was far greater than he realised. These reserves were used to re-equip the mauled 5th Guards Tank Army, which launched Operation Rumyantsev a couple of weeks later. The result was a battle of attrition they were ill prepared for and which they had little chance of winning. Operation Polkovodets Rumyantsev was intended as the main Soviet offensive for 1943. Its aim was to degrade the 4th Panzer Army and cut off the extended southern portion of Army Group South. After the heavy losses sustained by the Voronezh Front, during Operation Citadel, the Soviets needed time to regroup and refit, delaying the start of the offensive until 3 August. Diversionary attacks, launched two weeks earlier across the Donets and Mius Rivers into the Donbass, drew the attention of German reserves and thinned the defending forces that would face the main blow. The offensive was initiated by the Voronezh Front and Steppe Fronts against the northern wing of Army Group South. They drove through the German positions, making broad and deep penetrations. 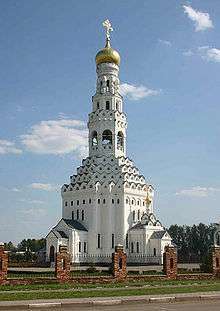 By 5 August, the Soviets had liberated Belgorod. Though the location, plan of attack, and timing were determined by Hitler, he blamed the defeat on his General Staff. Unlike Stalin, who gave his commanding generals the liberty to make important command decisions, Hitler's interference in German military matters progressively increased while his attention to the political aspects of the war decreased. The opposite was true for Stalin; throughout the Kursk campaign, he trusted the judgment of his commanders, and as their decisions led to battlefield success it increased his trust in their military judgment. Stalin stepped back from operational planning, only rarely overruling military decisions, resulting in the Red Army gaining more freedom of action during the course of the war. A German soldier inspects a knocked out T-34 during the Battle of Kursk. Russian military historian Grigoriy Krivosheyev, who based his figures on the Soviet archives, is considered by historian David Glantz as the most reliable source for Soviet casualty figures. His figures are supported by historian Karl-Heinz Frieser. Krivosheyev calculated total Soviet losses during the German offensive as 177,877 casualties. The Central Front suffered 15,336 irrecoverable casualties and 18,561 medical casualties, for a total of 33,897 casualties. The Voronezh Front suffered 27,542 irrecoverable casualties and 46,350 medical casualties, for a total of 73,892. The Steppe Front suffered 27,452 irrecoverable casualties and 42,606 medical casualties, for a total of 70,085. Karl-Heinz Frieser, who reviewed the German archive record, calculated that during Operation Citadel 54,182 casualties were suffered. Of these, 9,036 were killed, 1,960 were reported missing and 43,159 were wounded. The 9th Army suffered 23,345 casualties, while Army Group South suffered 30,837 casualties. Throughout the Soviet offensives, 86,064 casualties were suffered. In facing Operation Kutuzov, 14,215 men were killed, 11,300 were reported missing (presumed killed or captured) and 60,549 were wounded. During Polkovodets Rumyantsev, 25,068 casualties were incurred, including 8,933 killed and missing. Total casualties for the three battles were about 170,000 men. By 16 July, Army Group South claimed 161 tanks and 14 assault guns lost. Up to 14 July, 9th Army reported they had lost as total writeoffs 41 tanks and 17 assault guns. These losses break down as 109 Panzer IVs, 42 Panthers, 38 Panzer IIIs, 31 assault guns, 19 Elefants, 10 Tigers and three flame tanks. Before the Germans ended their offensive at Kursk, the Soviets began their counteroffensive and succeeded in pushing the Germans back into a steady retreat. Thus, a report on 11 August 1943 showed that the numbers of total writeoffs in Panthers swelled to 156, with only 9 operational. The German Army was forced into a fighting retreat and increasingly lost tanks in combat as well as from abandoning and destroying damaged vehicles. Across the entire Eastern Front 50 Tiger tanks were lost during July and August, with some 240 damaged. Most of these occurred during their offensive at Kursk. Some 600 tanks sustained damage in the period from 5 July to 18 July. ↑ "After Kursk, Germany could not even pretend to hold the strategic initiative in the East." (Glantz & House 1995, p. 175). ↑ "With the final destruction of German forces at Kharkov, the Battle of Kursk came to an end. Having won the strategic initiative, the Red Army advanced along a 2,000 kilometres (1,200 mi) front." (Taylor & Kulish 1974, p. 171). ↑ The breakdown as shown in Bergström (2007, pp. 127–128) is as follows: 1,030 aircraft of 2nd Air Army and 611 of 17th Air Army on the southern sector (Voronezh Front), and 1,151 on the northern sector (Central Front). (Bergström 2007, p. 21). ↑ The breakdown as shown in Zetterling & Frankson (2000, p. 20) is as follows: 1,050 aircraft of 16th Air Army (Central Front), 881 of 2nd Air Army (Voronezh Front), 735 of 17th Air Army (only as a secondary support for Voronezh Front), 563 of the 5th Air Army (Steppe Front) and 320 of Long Range Bomber Command. 1 2 Operation Citadel refers to the German offensive from 4 to 16 July, but Soviet losses are for the period of 5–23 July. ↑ The breakdown as shown in Frieser (2007, p. 154) is as follows: 9,063 KIA, 43,159 WIA and 1,960 MIA. 1 2 The whole Battle of Kursk refers to the period of the German offensive (Operation Citadel) and the subsequent Soviet counteroffensives, from 4 July to 23 August. ↑ Figures for 5–31 July, as given by the Luftwaffe logistics staff (Generalquartiermeister der Luftwaffe). ↑ The breakdown as shown in Krivosheev (1997, pp. 132–134) is as follows: Kursk-defence: 177,847; Orel-counter: 429,890; Belgorod-counter: 255,566. ↑ The breakdown as shown in Krivosheev (1997, p. 262) is as follows: Kursk-defence; 1,614. Orel-counter; 2,586. Belgorod-counter; 1,864. ↑ Historians Steven Newton (Newton 2002) and Dieter Brand (Brand 2003) make no mention of blitzkrieg in their characterization of the operation. ↑ Source includes: German Nation Archive microfilm publication T78, Records of the German High Command (Oberkommando der Wehrmacht) Roll 343, Frames 6301178–180, which confirms Hitler's teleprinter messages to Rommel about reinforcing southern Italy with armoured forces that were already destined to be used for Citadel. ↑ According to Zetterling & Frankson (2000, p. 18) these figures are for 1 July 1943 and accounts for only units that eventually fought in Operation Citadel (4th Panzer Army, part of Army Detachment "Kempf", 2nd Army and 9th Army). The figure for German manpower refers to ration strength (which includes non-combatants and wounded soldiers still in medical installations). The figures for guns and mortars are estimates based on the strength and number of units slated for the operation; the figure for tanks and assault guns include those in workshops. ↑ Over 105,000 in April and as much as 300,000 in June, according to Zetterling & Frankson (2000, p. 22). ↑ Nikolai Litvin, a Soviet anti-tank gunner present at the battle of Kursk, recalls his experience during the special training to overcome tank phobia. "The tanks continued to advance closer and closer. Some comrades became frightened, leaped out of the trenches, and began to run away. The commander saw who was running and quickly forced them back into the trenches, making it sternly clear that they had to stay put. The tanks reached the trench line and, with a terrible roar, clattered overhead ... it was possible to conceal oneself in a trench from a tank, let it pass right over you, and remain alive." (Litvin & Britton 2007, pp. 12–13). ↑ This order of battle does not show the complete composition of the Steppe Front. In addition to the units listed below, there are also the 4th Guards, 27th, 47th and 53rd Armies. (Clark 2012, p. 204). Perhaps the order of battle below represents only the formations relevant to Operation Citadel. ↑ The air operation is misunderstood in most accounts. The German Freya radar stations at Belgorod and Kharkov in 1943 had only picked up Soviet air formations approaching Belgorod and were not responsible for the failure of the entire Soviet preemptive air strike on the eve of Operation Citadel. (Bergström 2007, pp. 26–27). ↑ Beevor 2012, p. 485, "The German army had received a severe battering... the Germans had no choice but to withdraw to the line of the River Dnepr, and start to pull their remaining forces out from the bridgehead left on the Taman peninsula". 1 2 3 4 Glantz & House 2004, p. 338. 1 2 Glantz & House 1995, p. 165. 1 2 3 4 Frieser 2007, p. 100. ↑ Bergström 2007, pp. 123–125: Figures are from German archives. Bundesarchiv-Militararchiv, Freiburg; Luftfahrtmuseum, Hannover-Laatzen; WASt Deutsche Dienststelle, Berlin. 1 2 3 4 5 Glantz & House 2004, p. 337. ↑ Bergström 2007, pp. 127–128, figures are from Russian archives; Russian aviation trust; Russian Central Military Archive TsAMO, Podolsk; Russian State Military Archive RGVA, Moscow; Monino Air Force Museum, Moscow..
↑ Zetterling & Frankson 2000, p. 20. 1 2 3 4 Frieser 2007, p. 154. 1 2 3 Beevor 2012, p. 485. ↑ Glantz & House 2004, p. 276. 1 2 U.S. Army Concepts Analysis Agency, Kursk Operation Simulation and Validation Exercise – Phase III (KOSAVE II), p. 5-14 through 5–15. ↑ Clark 2012, p. 408. ↑ "Heeresarzt 10-Day Casualty Reports per Army/Army Group, 1943". World War II Stats. Retrieved 4 July 2015. ↑ Frieser 2007, p. 201: Exact numbers are unknown; the entire German eastern front lost 1,331 tanks and assault guns for July and August, so the number of 760 is an estimate. ↑ Bergström 2008, p. 120. ↑ Krivosheev 2001, p. Kursk. 1 2 Krivosheev 2001, p. Weapons and military equipment. Production and loss. 1 2 Frieser 2007, p. 150. 1 2 3 Krivosheev 2001. ↑ Krivosheev 1997, pp. 132–134. ↑ Krivosheev 1997, p. 262. ↑ Glantz & Orenstein 1999, p. 1. ↑ Glantz & House 1995, pp. 157. ↑ Nipe 2011, p. 6. ↑ Healy 2010, p. 42. ↑ Healy 2010, p. 90. ↑ Healy 2010, p. 65. 1 2 3 4 Newton 2002, p. 12. ↑ Dunn 1997, p. 94. ↑ Kasdorf 2000, p. 16. ↑ Glantz & House 2004, pp. 64–67. ↑ Glantz 1989, pp. 149–159. ↑ Glantz 2013, p. 184. ↑ Glantz & House 1995, pp. 166. ↑ Glantz 1986, p. 66. 1 2 3 Kasdorf 2000, p. 7. ↑ Clark 2012, p. 167. ↑ Clark 2012, p. 176. ↑ Glantz & House 2004, p. 11. ↑ Healy 2010, p. 27. ↑ Citino 2012, pp. 66-67. 1 2 Kasdorf 2000, p. 8. ↑ Citino 2012, pp. 69-70. 1 2 3 Clark 2012, p. 177. 1 2 Dunn 1997, p. 61. 1 2 Glantz & House 2004, p. 13. ↑ Citino 2012, pp. 68-70. ↑ Kasdorf 2000, p. 10. 1 2 Glantz & House 2004, pp. 11, 13. 1 2 Clark 2012, p. 178. ↑ Healy 2010, p. 43. ↑ Newton 2002, p. 374. ↑ Showalter 2013, p. 262. ↑ Manstein 1983, p. 445. ↑ Manstein 1983, p. 446. ↑ Clark 2012, p. 184. 1 2 3 Glantz & House 2004, p. 14. 1 2 Clark 2012, p. 186. ↑ Glantz & House 2004, p. 354. ↑ Clark 2012, pp. 178, 186. ↑ Citino 2012, p. 121. 1 2 Clark 2012, p. 187. ↑ Glantz & House 2004, p. 25. ↑ Newton 2002, p. 13. ↑ Clark 2012, pp. 194,196. 1 2 Glantz & House 2004, pp. 51–53. 1 2 Clark 2012, p. 197. 1 2 Clark 2012, p. 194. ↑ Healy 2010, p. 79. 1 2 Clark 2012, p. 193. 1 2 3 Glantz & House 2004, pp. 1–3. 1 2 Manstein 1983, pp. 480–482. 1 2 Showalter 2013, p. 49. ↑ Showalter 2013, pp. 49−50. 1 2 Showalter 2013, p. 50. 1 2 Glantz 2013, p. 183. 1 2 Clark 2012, p. 192. ↑ Guderian 1952, p. 308. ↑ Clark 1966, p. 327. 1 2 Glantz & House 2004, p. 55. ↑ Healy 2010, p. 83. 1 2 Taylor & Kulish 1974, p. 170. 1 2 Mulligan 1987, p. 329. ↑ Clark 2012, p. 223. ↑ Healy 2010, p. 132. ↑ Newton 2002, p. 25. 1 2 3 Zetterling & Frankson 2000, p. 18. ↑ Clark 2012, pp. 188, 190–191. ↑ Beevor 2012, p. 471. ↑ "ВОЕННАЯ ЛИТЕРАТУРА – [Мемуары] – Микоян А.И. Так было". Militera.lib.ru. Archived from the original on 4 July 2010. Retrieved 6 August 2010. ↑ Glantz & House 2004, pp. 28–29, mentions Nikolai Vatutin and Mikhail Malinin. ↑ Clark 2012, p. 189, mentions Stalin. 1 2 3 Taylor & Kulish 1974, p. 168. 1 2 3 Clark 2012, p. 189. 1 2 Рокоссовский Константин Константинович, Солдатский долг. — М.: Воениздат, 1988 (in Russian). Militera.lib.ru. Retrieved 17 June 2013. ↑ Clark 2012, p. 190. ↑ Glantz & Orenstein 1999, p. 28. ↑ Glantz & House 2004, pp. 28–29. ↑ Barbier 2002, p. 39. ↑ Clark 2012, p. 204. ↑ Glantz 2013, p. 195. ↑ Clark 2012, p. 202. ↑ "Фронты Советских Вооружённых Сил во время Великой Отечественной войны 1941-45". sci-lib.com. 1 2 3 4 5 Clark 2012, p. 203. 1 2 3 Zetterling & Frankson 2000, p. 22. 1 2 3 Glantz & House 2004, pp. 64–65. 1 2 3 4 Clark 2012, p. 211. 1 2 Glantz & Orenstein 1999, pp. 41, 49. 1 2 3 Soviet Storm: Operation Barbarossa 2011. ↑ Glantz 1986, p. 19, Glantz states 1,500 anti-tank mines per kilometre and 1,700 anti-personnel mines per kilometre..
↑ Glantz & House 2004, p. 65, Glantz states there were 2,400 anti-tank and 2,700 anti-personnel mines per mile..
↑ Glantz & Orenstein 1999, p. 39. ↑ Glantz & House 2004, p. 67. ↑ Glantz & Orenstein 1999, p. 290. 1 2 3 4 Glantz 1986, p. 20. 1 2 Glantz 1986, p. 24. 1 2 Healy 2010, p. 74. ↑ Barbier 2002, p. 58. ↑ Clark 2012, p. 208, Clark states 300 locomotives instead of 298..
↑ Newton 2002, p. 151. ↑ Glantz & House 1995, p. 90. 1 2 Clark 2012, p. 267. 1 2 Clark 2012, p. 267-268. ↑ Healy 2010, p. 113. ↑ Clark 2012, p. 210. ↑ Gerwehr & Glenn 2000, p. 33. 1 2 Glantz & Orenstein 1999, p. 241. 1 2 Healy 2010, p. 78. ↑ Glantz & Orenstein 1999, p. 135. 1 2 Beevor 2012, p. 472. ↑ Clark 2012, p. 222. ↑ Healy 2010, p. 172. ↑ Clark 2012, p. 204, provides similar but more specific figures. ↑ Liddell Hart 1948, p. 192. ↑ Beevor 2012, p. 471-472. ↑ Murray 1983, p. 158. 1 2 Newton 2002, p. 186. ↑ Newton 2002, p. 160. ↑ Newton 2002, p. 159. 1 2 Healy 2010, p. 104. ↑ Healy 2010, p. 103. ↑ Healy 2010, p. 105. ↑ Bergström 2007, pp. 79–81, 102, 106, 114, 118. ↑ Newton 2002, p. 155. 1 2 3 Frieser 2007, p. 112. ↑ Clark 2012, p. 196. ↑ "WWII Battle of Kursk: Mine/Countermine operations". oocities.org. Retrieved 20 October 2016. 1 2 3 4 5 Clark 2012, p. 237. 1 2 Healy 1992, p. 41. 1 2 Healy 2010, p. 201. ↑ Nipe 2011, p. 143. ↑ Healy 2010, p. 205. ↑ Clark 2012, pp. 475–477, The 2nd Panzer Army and 2nd Army are not included in the order of battle in the source. The 2nd Panzer Army did not take part in Operation Citadel, but played a significant part in Operation Kutuzov. The 2nd Army was tasked with pushing the western face of the salient once the encirclement was completed, but never got do so since the northern and southern pincers failed to meet at Kursk..
↑ Clark 2012, pp. 475–477. 1 2 3 Clark 2012, pp. 478–484. 1 2 Frieser 2007, p. 91. ↑ Glantz & House 2004, p. 346. 1 2 Glantz & House 2004, p. 345. 1 2 3 Glantz & House 2004, p. 81. 1 2 3 4 Barbier 2002, p. 59. ↑ Clark 2012, p. 224. ↑ Clark 2012, p. 226. ↑ Clark 1966, p. 329. ↑ Clark 2012, pp. 227, 233. ↑ Glantz & House 2004, pp. 84–86. ↑ Newton 2002, p. 77. 1 2 3 Clark 2012, p. 236. ↑ Zetterling & Frankson 2000, p. 77-78. ↑ Clark 2012, pp. 263. ↑ Glantz & House 2004, pp. 137. ↑ Clark 2012, pp. 263,314. ↑ Glantz & House 2004, pp. 118. 1 2 3 4 Clark 2012, p. 195. 1 2 3 4 Clark 2012, p. 261. ↑ Glantz & House 2004, p. 86. 1 2 3 Clark 2012, p. 264. 1 2 Clark 2012, p. 265. ↑ Clark 2012, p. 266. ↑ Münch 1997, pp. 50–52. 1 2 Clark 2012, pp. 120, 266. 1 2 3 Clark 2012, pp. 309. ↑ Frieser 2007, p. 108. ↑ Glantz & House 2004, p. 93, 117. ↑ Clark 2012, pp. 120, 306. 1 2 Glantz & House 2004, p. 93. 1 2 Clark 2012, pp. 308. ↑ Glantz & House 2004, p. 117. 1 2 Beevor 2012, p. 478. ↑ Clark 2012, pp. 309–311. ↑ Glantz & House 2004, p. 115. ↑ Clark 2012, pp. 313. ↑ Glantz & House 2004, p. 121. ↑ Zetterling & Frankson 2000, p. 91. ↑ Clark 2012, pp. 312. ↑ Glantz & House 2004, p. 115, 120-121. ↑ Frieser 2007, p. 110. ↑ Glantz & House 2004, p. 118,121. ↑ Zetterling & Frankson 2000, p. 94. ↑ Healy 2010, p. 286-287. ↑ Overy 1995, p. 204. ↑ Healy 2010, p. 287. 1 2 Zetterling & Frankson 2000, p. 95–96. ↑ Clark 2012, p. 238, 240. 1 2 Clark 2012, p. 242. ↑ Clark 2012, p. 241. ↑ Clark 2012, p. 68. 1 2 Clark 2012, p. 246. 1 2 3 Clark 2012, p. 247. ↑ Clark 2012, p. 248. ↑ Clark 2012, p. 250. ↑ Clark 2012, pp. 252–253. 1 2 Clark 2012, p. 254. ↑ Clark 2012, p. 255. 1 2 Clark 2012, p. 256. ↑ Clark 2012, p. 256-257. ↑ Beevor 2012, p. 481. ↑ Clark 2012, pp. 257-259. ↑ Clark 2012, p. 259. 1 2 3 Clark 2012, p. 260. ↑ Zetterling & Frankson 2000, p. 101. ↑ Glantz & House 2004, p. 113,133. 1 2 3 Zamulin 2011, p. 159. ↑ Glantz & House 2004, p. 113. ↑ Clark 2012, p. 287–288. ↑ Clark 2012, p. 478–484, The Soviet order of battle. ↑ Nipe 2011, p. 72. ↑ Glantz & House 2004, p. 114. 1 2 Glantz & House 2004, p. 114, 133–135. ↑ Glantz & House 2004, p. 135, tank losses are given as 50. ↑ Clark 2012, p. 299, tank losses are given as 50 in the first air raid and another 30 in subsequent air raids. ↑ Glantz & House 2004, p. 135. 1 2 Clark 2012, p. 298–299. ↑ Bauman 1998, p. 8-4 to 8-5. ↑ Clark 2012, pp. 68, 279, map on page 68 shows 18–20 miles. ↑ Glantz & House 2004, p. 130, the map shows 18–20 miles. ↑ Zetterling & Frankson 2000, p. 90, this places it at 28 km at the end of 7 July. ↑ Bauman 1998, pp. 8–5 to 8–6, this places it at 23 km. ↑ Newton 2002, p. 6. 1 2 3 Brand 2003. ↑ Clark 2012, pp. 350–353. ↑ Glantz & House 2004, pp. 169, 171. ↑ Yeide 2014, p. 178. ↑ Healy 2010, pp. 301–302. ↑ Newton 2002, p. 7. ↑ Nipe 2011, p. 311. ↑ Nipe 2011, p. 324. ↑ Nipe 2011, p. 310. ↑ Nipe 2011, p. 309. ↑ Bergström 2007, p. 77. ↑ Clark 2012, p. 363. ↑ Beevor 2012, p. 482. ↑ Glantz & House 2004, p. 187, in Moscow time. ↑ Barbier 2002, p. 139. ↑ Zamulin 2011, p. 349. ↑ Nipe 2011, p. 304. ↑ Brand 2003, p. 7. ↑ Nipe 2011, p. 341. ↑ Brand 2003, p. 11. ↑ Bergström 2007, pp. 79–80. ↑ Brand 2003, p. 12. ↑ Showalter 2013, p. 269. ↑ Brand 2003, p. 1. ↑ "чпеообс мйфетбфхтб – [чПЕООБС ЙУФПТЙС] – уБНУПОПЧ б.н. лТБИ ЖБЫЙУФУЛПК БЗТЕУУЙЙ 1939–1945". Militera.lib.ru. Retrieved 6 August 2010. ↑ Bergström 2007, p. 81. ↑ Frieser 2007, pp. 130, 132. 1 2 Glantz & Orenstein 1999, p. 275. ↑ Healy 2010, p. 353. ↑ Healy 2010, p. 354. 1 2 Healy 2010, p. 355. ↑ Clark 1966, pp. 337–338. ↑ Glantz & House 2004, p. 218. ↑ Manstein 1983, p. 504. ↑ Kasdorf 2000, p. 22. ↑ Healy 2010, p. 109. ↑ Kasdorf 2000, p. 32. ↑ Frieser 2007, p. 111, 185. ↑ Overy 1995, p. 205. ↑ Overy 1995, pp. 204–205. ↑ Frieser 2007, p. 188. ↑ Glantz & House 1995, p. 297. ↑ Glantz & House 2004, p. 241. ↑ Glantz & House 2004, p. 245. ↑ Frieser 2007, p. 196. ↑ Glantz & House 2004, p. 249. ↑ Glantz & House 1995, p. 70. ↑ Bergström 2007, p. 121. ↑ Taylor & Kulish 1974, p. 171. ↑ Liddell Hart 1948, p. 216. ↑ Glantz & House 2004, p. 9. ↑ Healy 2010, p. 366. ↑ Nipe 2011, p. vi. 1 2 Glantz & Orenstein 1999, p. 274. ↑ Frieser 2007, pp. 150, 200, and the pages onward. 1 2 Glantz & Orenstein 1999, p. 276. ↑ G.F. Krivosheyev (1993) "Soviet Armed Forces Losses in Wars, Combat Operations and Military Conflicts: A Statistical Study". Military Publishing House Moscow. Retrieved 4 July 2015. 1 2 Healy 2010, p. 367. ↑ Glantz & Orenstein 1999, pp. 276–277. ↑ Bergström 2010, p. 121. 1 2 Frieser 2007, p. 202. ↑ Frieser 2007, p. 151. ↑ Frieser 2007, p. 204. ↑ Bergström 2010, p. 120. Brand, Dieter (2003). "Vor 60 Jahren: Prochorowka (Teil II)". Österreichische Militärische Zeitschrift (in German). Bundesministerium für Landesverteidigung und Sport (6). ——— (January 1995). The Luftwaffe's Army Support Doctrine, 1918–1941. The Journal of Military History. 59. pp. 53–76. doi:10.2307/2944364. ISSN 1543-7795. Hinley, Sir Harry (1996). "The Influence of ULTRA in the Second World War". cl.cam.ac.uk. Retrieved 13 June 2013. Töppel, Roman (2001). "Die Offensive gegen Kursk 1943 – Legenden, Mythen, Propaganda" (MA thesis)|format= requires |url= (help) (in German). Dresden: Technical University.